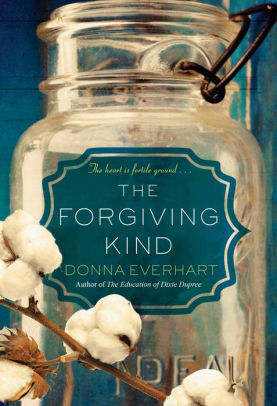 The Forgiving Kind by Donna Everhart is a very highly recommended family drama set in 1950s North Carolina. Twelve-year-old Martha “Sonny” Creech and her two older brothers, Ross and Trent, work hard alongside their Dad on their cotton farm. Sonny feels a connection to and loves the land as much as her father does. She also inherited his ability for divining water. When a devastating accident claims her father's life, Sonny and her family are not only grieving, but heading for disaster and poverty if they can't pay for the seed to plant their cotton crop. When their weird, but wealthy, neighbor, Frank Fowler stops by and suggests a deal to help finance their crop, Sonny's mom, Olivia, accepts the deal even though she and Ross don't trust him. Neither does her best friend, Daniel, who tells Sonny that the man must have ulterior motives. Soon it becomes apparent that Fowler is a cruel, mean-tempered bully who bosses the kids around and calls them names, but acts very different around their mother. Sonny tries to tell her mom that he is no good, but she doesn't see his dark side until it is too late. This is a riveting, compelling, and emotionally complex story that grips you from the start and doesn't let go. The narrative is spellbinding, heartbreaking, beautiful, and tragic. It will make you cry, feeling furious and impotent, as foreshadowing clearly indicates that a violent disaster is in the making and you are waiting for the tragedy to happen. I found myself raging silently at Sonny's mom, Olivia, finding it hard to believe she couldn't see who Frank Fowler really was through his fake facade. The writing is absolutely excellent. Everhart decisively captures time and place, placing her well-developed characters firmly in North Carolina in 1955 as they deal with what seems like a situation that will be impossible to escape. The well-paced plot raises the tension and anxiety of the reader and then keeps you there, anticipating, knowing something awful is going to happen. The descriptive prose depicts both the beautiful and sordid in this coming-of-age story of abuse, violence, prejudice, perseverance, endurance, friendship, and family. The juxtaposition of the exceptional writing with the disclosure of the ugliness within the narrative helps make the novel and its themes even more poignant. Disclosure: My review copy was courtesy of Kensington.